This chapter provides a step-by-step walk through of building your own custom connector. Less common features are not included here. For details and examples, navigate to the respective chapters. The custom connector framework supports building connectors to applications that offer an API reachable over HTTP/HTTPS. The common request/response formats are supported: JSON (default), XML, www-form-urlencoded and multipart. Mix in more request options. Access the response, at which point the request is lazy-executed. No request has been made yet: The result so far is the cued-up request for the base URL, and with the request and expected response format set to the default, JSON. Payload fields (PATCH, POST, PUT only), also passed as a hash. With these basics out of the way, we can now walk through an example connector, and show how its various parts relate to how users will edit and run recipes. Back outside connection, the test component lets the connection be tested, e.g. 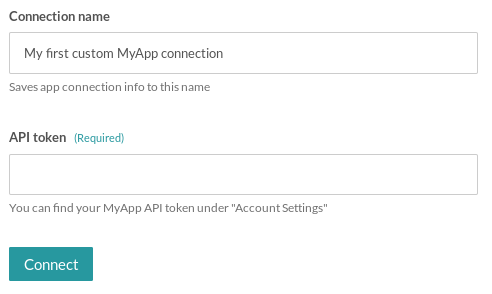 to make sure the credentials, like api_token in this example, are still valid. With non-OAuth connectors only: when the Connect button is clicked. In all cases: When starting a recipe, each connection used in it has the corresponding test called; starting the recipe fails if any test raises an error. When one of the connector&apos;s actions is used in a recipe, its input form is based on its input_fields lambda, which also uses the schema notation. At runtime, when the job reaches a recipe line that uses this action, its execute lambda is called. The first argument is the connection fields, packaged in a hash object. The second argument is the action&apos;s input, evaluated based on how the input form is configured in the recipe. Also packaged as a hash object. As discussed earlier, the execute lambda makes the request. The result, lazy-evaluated either within the lambda or right after it returns, is expected to contain the specified output fields. Similar to actions, but describes what each one of the collection of records that the trigger&apos;s poll (see below) contains. There are two types of trigger, to cater to two common patterns in such API endpoints: "Ascending" (the default), and "paging", a.k.a. descending. These are API endpoints that list records in the same order as we would want them consumed. This is typically ascending in creation or modification time. This is the array of events polled (customer objects in this case), out of which jobs may be started with the recipe. An object to be passed as the last argument (named to last_created_since in this example) to the next poll cycle. Use this to maintain a "cursor" for the next request. A flag that informs the runtime whether more results may be immediately available. If true, a further poll will be made (almost) immediately. It is not always possible to prevent the same record from appearing in separate poll invocations. To avoid duplicate recipe jobs, the runtime uses dedup, passing it each item returned in events. The output is a unique identifier associated with the recipe job that results from that item. 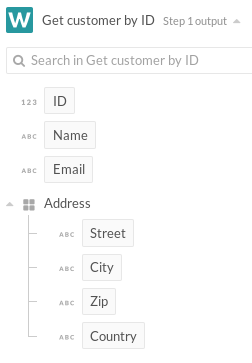 For triggers that track the creation of new objects, the unique identifier is typically the application-specific unique ID for that object. These are endpoints that list records in the opposite order from the one we want them consumed. The polling strategy for these endpoints is to "page" backwards, until we reach the beginning of the result set (or results we have processed before). At that point the runtime handles creating the recipe jobs in the "correct" order. Similar to the ascending variant&apos;s events, but expected to be in descending order. If present (not nil), this signals the runtime that there may be more, "earlier", events available in the endpoint. This value will be passed to the next poll as the third argument, named last_created_before in this example. In comparison with the ascending trigger variant, this value plays the roles of both the "cursor" (next_poll) and poll timing hint (can_poll_more). Extracts the unique ID of the underlying object. This is optional, if absent then the default behavior is to use the field called id (case insensitive) in the object (the example above just illustrates the default). Note: This is not the same as dedup below. Extracts a sorting/ranking value for the underlying object, so the runtime can determine whether we have polled "far enough" backwards. Performs the same de-duplication logic as in the case of ascending triggers. However in the case of descending triggers it is optional; example above is the default, of combining the result of document_id and sort_by, separated by a @ character. The connector should be ready to be used.